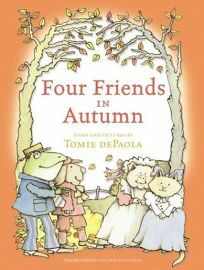 Originally published as part of Four Stories for Four Seasons (1977), Four Friends in Autumn by Tomie dePaola follows Mistress Pig as she invites her friends, Mister Frog, Missy Cat and Master Dog, over for a fancy dinner to celebrate the lovely fall weather. But will her victuals actually make it to the table? .